July 1 is National Gingersnap Day. The small round cookies will be the best treat for today. 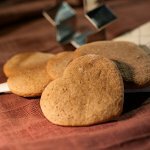 Gingersnap cookies flavored with ginger, cloves, cinnamon and allspice (sometimes it is used), appeared during the Medieval times in Germany. Their predecessor was the Lebkuchen, German Christmas version of gingerbread cookies. The first mentions of the Lebkuchen date back to 1296 and 1395. But we're sure, that this kind of cookies was known to Germans even earlier. The Lebkuchen evolved to different varieties of gingersnaps and every country has its own preferences in making them. For example, Scandinavian gingersnaps are very thin, that is why they are crispy. The U.S and UK gingersnaps are about 1/8-1/4 inch thin. Gingersnap cookies are the same as gingerbread, although the latter is traditionally made in shapes. Gingersnaps are always plain and round cookies and they are snap to make. So enjoy your favorite gingersnap cookies with a cup of tea, coffee, hot chocolate or milk. And if you want something refreshing, combine gingersnap and ice cream or frozen yogurt.